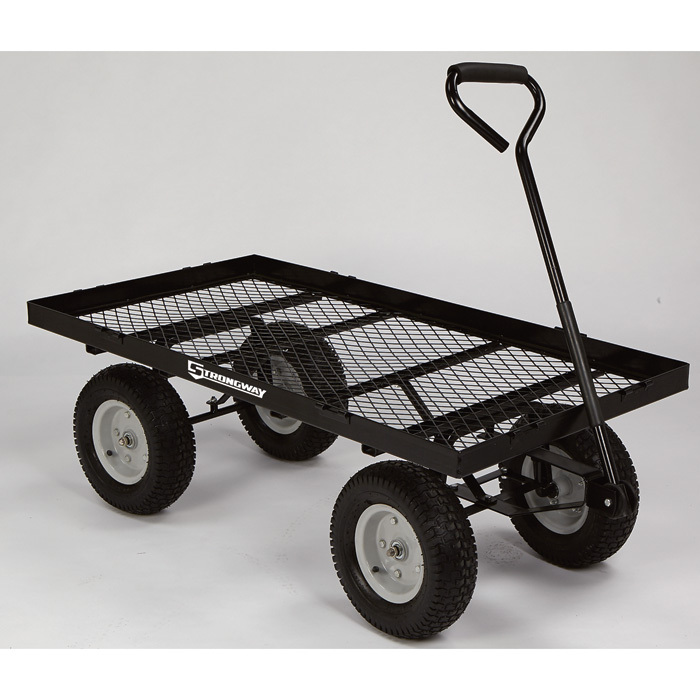 Strongway Steel Jumbo Garden Wagon — 1,400-Lb. Capacity, 48in.L x 24in.W. a minimum speed of 10 mph under 700 lbs load over hard packed dirt with a maximum incline of 10% for a minimum run time of 90 minutes and a minimum range of 15 miles. I am willing to change one or both sprockets to obtain optimal performance between the two full load and "half load" scenarios. For the 1,400 lbs loading, the primary power will be supplied via an on-board ac-to-dc converter tethered to a 110 VAC/60 Hz (nominal) outlet. For the 700 lbs loading, primary power will be supplied by on-board battery pack. Do you have any motor-sprocket combinations that are capable of moving the wagon at the stated performance parameters given that the wagon will use a solid live axle rear wheel drive implementation? Would an alternative drive implementation such as four (4) wheel drive yield better performance? If it designed for a 10 MPH speed under a 700-pound load with 10% inclines then when regeared for walking speed of 3 or 4 MPH it will have no problem with 1400 pounds. I ran some calculations and found that a motor without a gearbox would require an axle sprocket larger than the wheels so a gear motor or set of gear motors would be needed. With a single 1000 Watt gear motor the uphill speed with a 700-pound load and 150-pound vehicle on a 10% grade is only 4 MPH so the top speed gearing would need to be 8 MPH or less. To get a top speed over 10 MPH two 1000 Watt gear motors would be needed. Due to various terrain and load conditions, the runtime can only be estimated. Our runtime calculator estimates that with two 48 Volt 1000 Watt motors running at full speed on flat ground with some hills four 12V 60Ah batteries are needed. We have no experience running our controllers from ac-to-dc converters so that would be considered experimental to us. I would only expect a four-wheel drive powertrain to provide better performance in regards to the wagon's traction, and not to the power of the drivetrain or runtime of the battery pack. Our calculators are showing that with 2000 Watts of motor power, 850-pound total vehicle weight, and 10% grade the 10% grade uphill speed would be 8 MPH, so I would feel comfortable making the top speed gearing for 15 MPH which would be achieved on flat ground. Here is the gear ratio calculation with our 48V 1000W gear motor and the wagon's 13" diameter wheels. I would not run an electric motor under full load at less than half the motors rated RPM otherwise you run the risk of lugging and overheating the motor and/or speed controller. The motor is only efficient under full load at higher RPMs and at lower RPMs, it will demand excessive current from the controller while at the same time quickly increasing its coil, rotor, and case temperatures. When an electric motor is lugged usually its external wires and/or connector will start to overheat and melt first followed by a catastrophic failure of either the motor or controller due to overheating. Our motor power calculator is newer and more accurate than our grade power calculator so I would base the calculations off of it. Since it shows that the 10% grade speed is 4 MPH for a 1000 Watt motor then the top speed I would gear it for with a 1000 watt motor is 8 MPH. To gear it for 15 or 16 MPH I would use two 1000 Watt motors or one 2000 Watt motor so the 10% grade speed is 8 MPH. We do not have a calculator to determine the motor RPM under load and our motor power calculator presumes that the gear ratio allows the motor to run in its power band when calculating for a grade. I am not able to answer your second or third questions without asking a couple of questions first. Are you planning on changing sprockets between the 1,400 lbs load and 700 lbs load, or using the same sprockets? Do the 1,400 lbs and 700 lbs loads both need to travel up a 10% incline? Yes, I plan on changing one or both sprockets between the 1,400 lbs load configuration and the 700 lbs load configuration. No, the 1,400 lbs load does not require the 10% incline performance. For the 700 lbs loading, primary power will be supplied by an on-board battery pack.For the 1,400 lbs loading I plan to use an off-vehicle tethered DC voltage source. Please recommend a complete kit for these requirements noting that a battery pack is only needed for the 700 lbs load portion of the requirements. Just checking to see if you can recommend parts or a kit for my requirements. Please let me know if it is not possible.